경상북도 월성군에 있는 감산사는 신라 성덕왕 18년(719)에 김지성이 부모의 명복을 빌고, 국왕과 왕족의 안녕을 기원하기 위해 창건한 사찰이다. 창건한 해에 그는 어머니를 위해 미륵보살을, 아버지를 위해 아미타불을 만들었다고 한다. 현재 경주 감산사 석조미륵보살입상(국보 제81호)과 경주 감산사 석조아미타불입상(국보 제82호)은 국립중앙박물관에서 보관하고 있다. 석조미륵보살입상은 머리에 화려하게 장식된 관(冠)을 쓰고 있으며, 얼굴은 볼이 통통하여 원만한 인상이다. 목에는 2줄의 화려한 목걸이가 새겨져 있고, 목에서 시작된 구슬 장식 하나가 다리까지 길게 늘어져 있다. 왼쪽 어깨에 걸치고 있는 옷은 오른쪽 겨드랑이를 지나 오른팔에 감긴 채 아래로 늘어져 있다. 허리 부근에서 굵은 띠장식으로 매어 있는 치마는 부드러운 곡선을 그리면서 발목까지 내려오고 있다. 몸에서 나오는 빛을 상징하는 광배(光背)는 불꽃무늬가 새겨진 배(舟) 모양이며, 3줄의 도드라진 선으로 머리광배와 몸광배를 구분하였다. 불상이 서 있는 대좌(臺座)는 하나의 돌로 만들었는데, 맨 아래가 8각이고, 그 위에는 엎어 놓은 연꽃무늬와 활짝 핀 연꽃무늬를 간략하고 큼직하게 새기고 있다. 광배 뒷면에는 신라 성덕왕 18년(719)에 불상을 조각하였다는 기록이 새겨져 있는데, 이 글을 통해서 만들어진 시기와 유래를 알 수 있다. 돌로 만들었음에도 풍만한 신체를 사실적으로 능숙하게 표현하고 있어 통일신라시대부터 새로이 유행하는 국제적인 양식을 잘 보여주고 있는 작품으로 평가된다. Located in Wolseong-gun, Gyeongsangbuk-do, Gamsansa Temple was built in 719 by a dedicated Silla Buddhist named Kim Ji-sung who wanted his religious devotion to move Buddha to bring peaceful rest to his deceased parents and protect the king and his royal family. 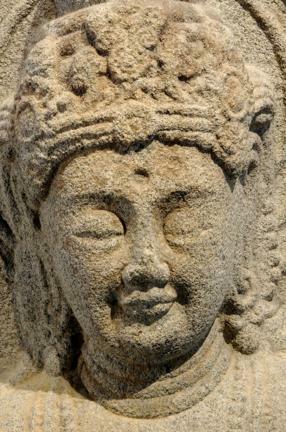 He is said to have commissioned this Maitreya bodhisattva (National Treasure No. 81) for his mother and the Amitabha Buddha (National Treasure No. 82) for his father. Both stone statues are now stored in the National Museum of Korea in Seoul. This Maitreya statue is characterized by the lavishly decorated headgear that it wears and the attractively plump face wearing a benign expression. He is also wearing two luxurious beaded necklaces and a third beaded ornament draped from the neck further down to the legs. 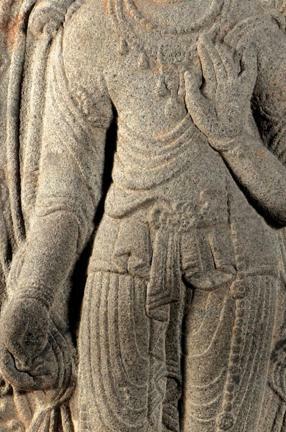 The robe is draped from the left shoulder, leaving the right bare, to cover the right arm before being drawn further downward; the skirt, worn with a beaded belt, runs downward to cover the ankles. 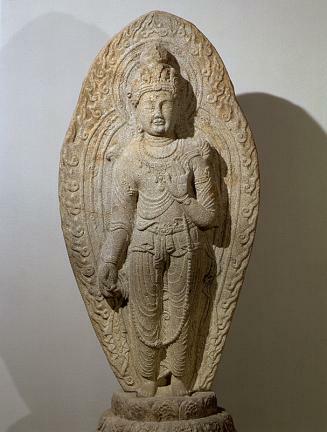 Behind the bodhisattva is a mandorla representing the rays of light spreading from his head and body and which is edged with a flame motif. 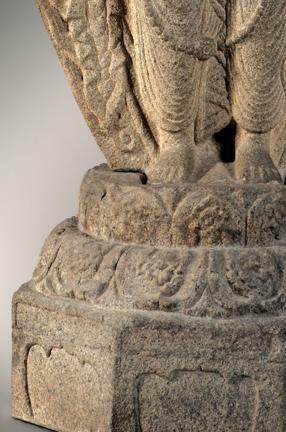 The pedestal on which the bodhisattva stands consists of a double-tier lotus base put on an octagonal foundation, all of which are carved with a single stone block. 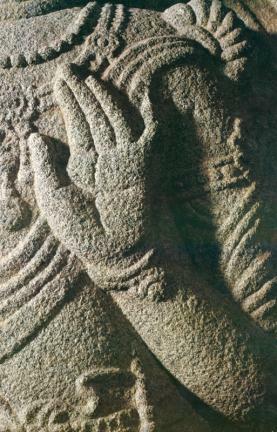 Behind the mandorla is an inscription showing that the bodhisattva was carved in 719 when Silla was under the rule of King Seongdeok. 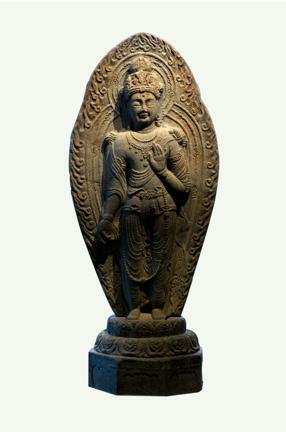 The technique of rendering the bodhisattva’s voluminous body suggests that the Silla artisans during this period were under the influence of the interregional trend of their time.